Made of antacid, surgical stainless steel. Tweezers undergo a 45 step production process. Finished by hand under magnifier glasses to ensure perfect alignment. Plucking the eyebrows is not a casual act. Brows are the hottest subject in beauty right now, and a lot of thought goes into every hair that is plucked from each brow. So the need to have the eyebrow tweezers to keep your brows on point is one we can really relate to. Each person may look for certain details in a pair of tweezers, but no matter what suits your fancy, there are some features this make-up bag staple must always have. Using tweezers on your brows instead of waxing or threading allows you to have the most natural looking brow shape. Waxing your brows can give them a shape that looks too perfect to be natural, and threading can get rid of too many hairs. Tweezing, however, leaves you in full control of what happens with every single hair on your face. The only wild card? It depends on the quality and abilities of the tweezers you use. 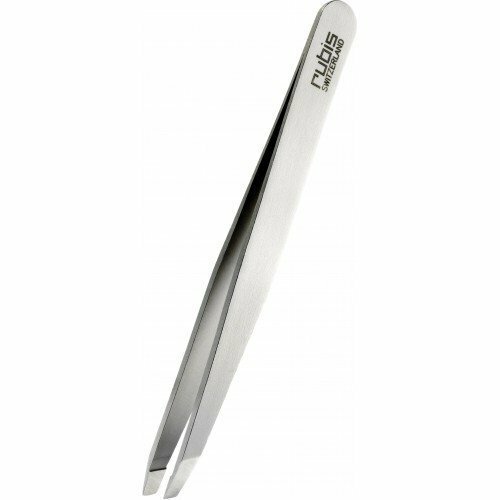 The Rubis Stainless Steel Slant Classic Tweezer has a perfect weight and a sandblasted finish that not only gives them a quality pewter look but also allows you to keep an unfaltering grip on them while tweezing your brows. This Rubis Stainless Steel Slant Classic Tweezer was made by fusing two pieces of stainless steel together. While it may seem like using two pieces of metal instead of one would give you a less effective pair of tweezers, research has shown that the opposite is actually true. This design means they have a stronger grip, it takes less time and effort to squeeze them together and grab the desired hair or hairs, and the two ends stay in place perfectly without becoming unaligned or losing their hold on the hair. These aspects of the design are what make it possible for its manufacturers to guarantee that these tweezers will grab every hair, every single time, including peach fuzz and stubble. Even very short hairs, such as two-day-old growth can be plucked out with these tweezers. Their weight and unfaltering grip on hair also make it easier to actually pluck hairs, and you don’t have to expend too much energy on the task. The Rubis Stainless Steel Slant Classic Tweezer is perfectly symmetrical. There is no chance that one side is longer than the other making plucking hairs less efficient. All of these qualities are why the Rubis Stainless Steel Slant Classic tweezers are the top choice when investing in a pair of tweezers to create beautiful eyebrows. Imported from Switzerland and being the luxury and prime choice for anyone who takes having perfectly shaped arches seriously, these tweezers are still quite affordably priced. To protect the ends and ensure they maintain their precision function, shape and grasp, these tweezers should be wiped down and cleaned frequently with a bit of rubbing alcohol and a cotton pad. The protective gel cap that comes with these tweezers should be returned to the ends of them after each use. This will help to protect the ends from getting damaged. While many say these are the perfect tweezers when new, they are cited for not coming with a warranty of any kind from Rubis, so when they go out of alignment, as most tweezers do eventually, there is nothing left to do but get a new pair. However, by using them for the purpose for which they were intended, being careful not to drop them and being gentle with them, Rubis Stainless Steel Slant End Classic Tweezers should serve you well for a long time. Some have enjoyed using them without any problems for 10 years even; however, companies often change how they manufacture a product, so don’t forget to recycle. These tweezers are usually sold by another company, and you usually won’t be getting them straight from Rubis, so if they are out of alignment or there are any other flaws when they arrive, then you should be able to send them back for a replacement or refund. These tweezers have been criticized for having ends that are too sharp. So, sometimes instead of gripping hairs so you can pull them out, they cut the hairs. However, when used correctly, these tweezers work well and are a favorite of many estheticians. Don’t squeeze too hard when grasping hairs, and pull in the direction that the hair naturally grows. To prevent damage, restrict these for plucking hairs and getting rid of splinters. Don’t use these to remove hard items firmly lodged into other objects, such as staples. Such use could damage the tips. While you may use these to handle jewelry and other fine objects, do so with care. Now, even though the Tweezerman Slant Tweezers are not the top pick, they were chosen 14 years in a row by Allure editors as the best tweezers. The slant on these tweezers is also an original creation, and this feature alone has won them an award too. We may think that the Tweezerman Slant Tweezers are inferior in quality, but something doesn’t have to be imported to be good quality. In fact, they are one of the most recommended types of tweezers by top eyebrow artists. This goes to show that you shouldn’t let a lower price fool you. Even a less fancy finish or look doesn’t mean the tweezers won’t work as well or last as long as their Gold Pick winner. These Tweezerman Slant Tweezers come very close to taking first place. They have a stainless steel finish, and the tips are hand-filed so they are sharp and perfectly angled. The Tweezerman tweezers actually allow you to maintain a good grip on them through their finish. Also, where most people would normally hold them, the words Tweezerman are etched into the side of the tweezers, and this also helps make them to have a non-slip grip. One of the biggest critiques of these tweezers is that they have very sharp, pointy ends. Although this feature can mean you accidentally harm yourself through an unintentional poke or cut from the tip, this is not one of their cons. The sharp tips make it easy to access and remove ingrown hair. Another highly notable feature of these tweezers is their slanted ends, which make it easy to select the desired hair or hairs for removal. The slanted ends also make it easier to use these tweezers in general because you don’t have to hold your hands in an unnatural position or tilt your face awkwardly to pluck the desired hair. With a relatively lower price tag, these tweezers have all of the features to meet your needs. At 3.8 inches in length and half than an inch wide, in your hands, these tweezers will feel like the fine, precision tools that they are. However, these Tweezermans are not so small that using them would be tedious. Rather, they act like an extension to your hand so you can effortlessly tweeze your eyebrows. The overall design seems to be what’s gotten these tweezers a five-star rating from almost every reviewer. Their finish allows you to maintain a firm grip on them, you don’t have to squeeze them to the point that your hands hurt even after doing maintenance on a long-neglected unibrow or overgrown arches. The brand “Tweezerman” etched on the tweezers also helps you grip these without experiencing any slippage. As for appearance, these tweezers are also a pleasure to behold with their sturdy stainless steel build and classic finish. The tips are hand-filed, which also is one of the reasons why they remain so sharp and aligned. The slanted tips make tweezing easy and quick and prevent hand cramping from having to hold the tweezers at an awkward angle to effectively get the job done. These have a nice finish, their hand-filed tips give them an authentic and real charm and overall, they have the look of tweezers that could do some seriously good tweezing. These sleek tweezers come in a natural cool classic stainless steel finish, which makes them easy to spot. They also come in many other stunning colors: Green Apple, Pretty In Pink, Granite Sky, Midnight Sky and Black. The manufacturers seem to have really outdone themselves with this cheaper version of our top pick Rubis Swiss Tweeze Tweezers. We start with the design because it’s the most original yet useful style feature out of all the ones here. The perforated sides of these Rubis Swiss Tweeze Tweezers, in addition to giving them a unique look, also has the advantage of creating tweezers with a secure grip that can be used by the wettest or oiliest of hands. 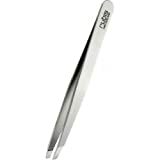 There is not much space between the ends of these Rubis Swiss Tweeze Tweezers so selecting the exact brow hairs you want to remove can be done quickly and without accidentally removing other hairs. Because, as any eyebrow perfectionist knows, every hair counts, and having plucked a few hairs too many can be disastrous. Although these are 3.8 inches in length, only about half of the tweezers are not already fused together creating an area that can be pressed to create the perfect amount of tension quickly in order to take hold of the desired hairs. These tweezers are sure to grip even the finest hairs, so there is no frustration when tweezing. This feature remains even after ages of use and has been noted by beauticians who use the same pair on multiple clients several times each day. The sharp tips on these tweezers make them perfect for accessing ingrown hairs, which you might be dealing with on your brows after a waxing. However, what this also means is that you have to be careful when using them since you could easily hurt yourself by accidentally poking, cutting or scratching yourself with these. These tweezers come in only one color: classic surgical steel; however, it is sandblasted, so it has a real cool and modern look to it. This steel won’t rust, it is not magnetic, and it is acid-proof. It could be the fact that these tweezers undergo a 45-step process or that they are completely handmade or that Rubis has been making high-quality tweezers for 60 years or that they are Swiss made, but they are one of the hottest tweezer brands on the market and are made even more so by the fact that famous make-up artists Bobbi Brown and Soul Lee prefer to use these. The Tweezer Guru Professional Stainless Steel Slant Tip Tweezers are for those of you who are determined to be ballin even on a budget. Very affordably priced, these tweezers will get the job done quite well and are quite stylish too with their catchy design. These cheap Tweezer Guru Professional Stainless Steel Slant Tip Tweezers are noted for their excellent performance, which shows clearly why you would want to choose these over other cheap store bought tweezers. These tweezers are perfect for your eyebrows, beard, mustache, chin and any other stray hairs on your body you would like to remove by the root. They work well for all hair types from thick to very fine hairs. These tweezers are thick and well-constructed of stainless steel and then finished in black, which also makes it a lot easier to focus on the job at hand, work a lot quicker and be much more detailed when tweezing. Manufactured in Pakistan, the perfectly aligned tips of these tweezers save you from making repetitive moves without removing the desired hairs. The tweezers are also perfectly calibrated so that the right amount of tension is created when you effortlessly squeeze them together to remove the desired hair. With many just looking for a cheap pair of tweezers that will work well for at least a few months, manufacturers are giving these tweezers a lifetime guarantee. This most likely means that the tips are not going to stay sharp enough for removing ingrown hairs, but it’s not one of the features of these tweezers anyway. In fact, this is one of their plus points because there is no chance of accidentally puncturing your skin with the tips of these tweezers. Also, they probably won’t be capable of removing minutely short hairs either. What the lifetime guarantee seems to imply is that these tweezers will meet your basic brow shaping and general tweezer needs for years to come. 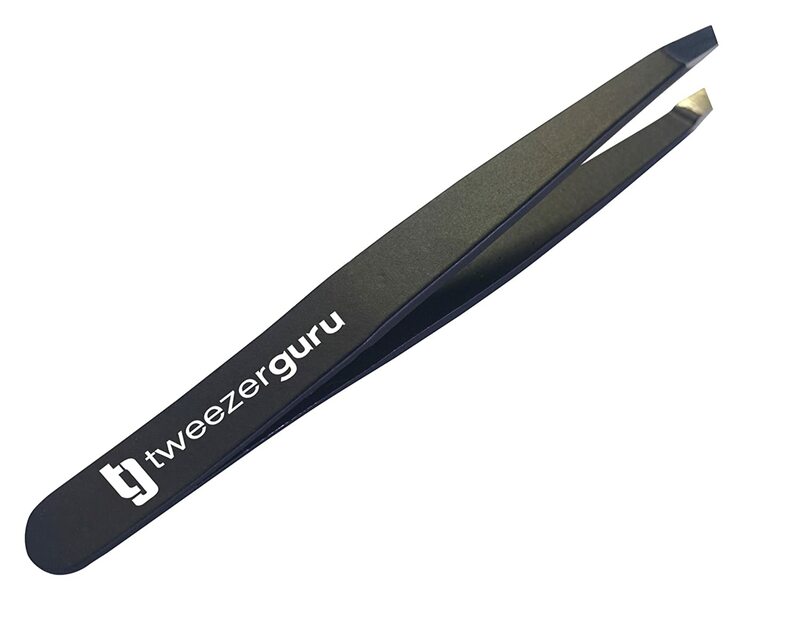 Tweezerguru slant tip tweezers do come with a plastic cover to protect the ends when they are not in use, and this will help protect them and anything they come in contact with when not in use. If the ends are supposed to be sharp, perfectly aligned and guaranteed to grip every single hair perfectly, then make sure that they do. If they don’t, then do not hesitate to send them back for a replacement. There are times when a single pair of tweezers are defective, and it doesn’t mean that all of the tweezers in the line are flawed. When the pair you receive is defective, the manufacturer or supplier will often happily replace them for you. What is the main feature you are looking for in a pair of tweezers? This may be different for everyone, but will usually be tweezers that grab a firm hold of every hair allowing you to pluck it out. You may also find it important to have a pair of tweezers that have a sharp tip so you can access ingrown hairs and pluck them out. You will want tweezers with a surface that stays intact. If they are advertised as stainless steel, then you will want to see that they are indeed stainless steel and don’t begin to rust after a short while. If they come with another coating or finish, then you would want one that stays so that the tweezers remain comfortable to use. The tweezers should be easy to press together to grip the selected hair. Usually, tweezers that are made from two pieces of metal fused together rather than one piece of metal folded in half will have this feature. You will want tweezers that allow you to maintain a firm grip on them even if your hands are wet, damp, oily or sweaty. Some tweezers have lettering etched along the sides where you hold them, holes, lines or some other design element that allows you to keep a firm hold on them while tweezing. You will want tweezers that come with a plastic cap to cover the tips or that come with a storage case. This not only protects the ends from being damaged which could result in tweezers that aren’t sharp or that don’t grasp hairs properly, but it also protects other items from being damaged by the sharp ends of the tweezers. Our eyebrows allow us to frame our face, and how we shape them is sort of like changing the frame of the face. So, it is natural that we would want the best tools for the job. The information here and the tips should help you to make an informed purchase when you go to buy the next pair of tweezers for your eyebrows.